Please visit the HOA website, www.BelwoodHomes.org, for the most current information on the membership areas, Cabaña, pool, and clubhouse. The cabaña offers a pool (lifeguards, swim lessons, The Dolphins swim team, and a great place to throw a party), basketball courts, and a clubhouse (where neighbors usually vote and other events happen throughout the year). If you are interested in renting the pool or cabaña for your event, please contact Gina Wagner, who is the Facility Manager for the Homeowner’s Association. She can be reached at 358-2229. 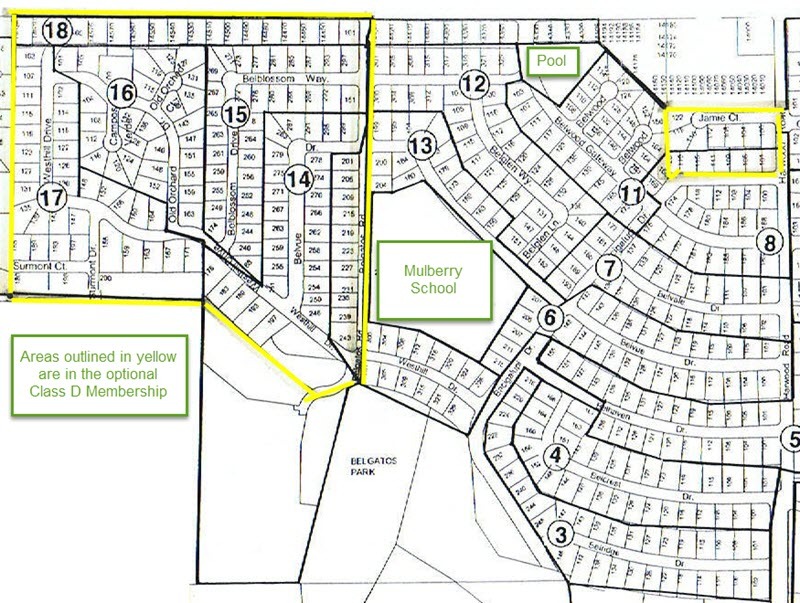 Part of the neighborhood automatically belongs to the cabaña and has “class A” (mandatory) membership. Part of the area has optional membership, or “class D”. **Swim Team Registration closed on March 20th; Swim team practice beings May 1st. 1. Members must carry membership cards at all times. 2. No Diving. No running on pool deck. No horseplay in and around pool area. 3. No alcohol allowed within the pool facility. No exceptions. 4. A life vest may only be worn by a child if he/she is accompanied by an adult in the pool. 5. Only children under 6 years of age are allowed in the kid’s pool. Children in the kid’s pool must be closely supervised by an adult within the pool facility at all times. Kid’s pool is not supervised by lifeguards. 6. Children under 10 years of age must be supervised by an adult within the pool facility at all times. 7. All swimmers are subject to a swimming proficiency test at the discretion of a lifeguard. 8. No glass allowed in the pool facility. No gum allowed within the pool facility. 9. User of the facility are required to clean up after themselves. 10. During cabaña hours, non-member guest fees are $3 per person. No exceptions. 11. Only members who have purchased a facility key may use the cabaña outside of cabaña hours. The actual homeowner must be present if the facility is being used outside of cabaña hours. No guests allowed. 12. A swimming lane will be provided when swim team is practicing for members wishing to use the pool. This only applies to non-swim team members who have purchased a facility key. 13. Adult swim will take place for the last 15 minutes of each hour while the pool is open. Children may swim during adult swim if accompanied by an adult in the pool (1 child per adult). 14. No pets allowed on the cabaña property. No exceptions. I own 124 Belvue and paid the fee for the year. I’m currently renting the home. What are the membership rules with regard to renters. We didn’t receive any membership cards when we paid the fee. My Parents bought the house in 1966. Thx ! Sorry for the delay in responding, I was traveling in Europe and just got back a couple of days ago – catching up! 408-218-1833 with a description of attached items. Hi – I’d like to know if we need approval from Belwood Cabana to get an instructor to teach swimming lessons to our infant. Coould you please let me know? Please contact me back as I would like to possibly rent out the cabana and would like to make sure I pay the fee for the pool key. Brandy this is not the home owner’s association site – hopefully you phoned them by now and got your key!